What in gods name is this. I think it's a Caribbean fireworm by look but not sure what they are or if it's good or how to get rid of it or anything. Someone educate me. I just got back from two weeks of vacation and I see this thing. It's at least 4-5 inches in length. Hard to tell from the video but it looks like a bristle worm. +1 for bristle worm, the fireworms are bright orange or red. Definitely just a bristle worm, very common in our reef systems. 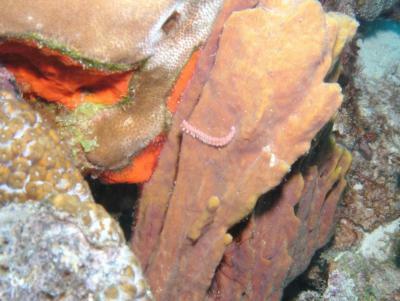 This is a Caribbean fireworm. I apologize for the poor quality picture as it was one of the first I had taken.